1/32: Monkey Lala, Caribbean beach cottage. 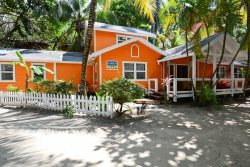 2/32: Caribbean cottage with traditional louvered windows and tons of island charm. 3/32: View of the deck and kitchen from the sofa. 7/32: Polished wood floors & an island breeze. 13/32: Your beach, less than 100 paces from the house. 16/32: Walkway to the beach. 27/32: Bathroom with large walk in shower and double vanity. 28/32: West Bay village from the dock. 30/32: Colourful fishing boats line the shore some days.